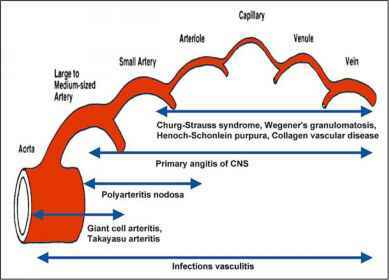 Vasculitis of the CNS is characterized by the size of the affected vessel, as illustrated in Fig. 7.1 . Determining size and location of the predominantly affected vessels is useful to obtain an optimal tissue biopsy and establish appropriate treatment . Large artery vasculitis usually responds well to steroids alone, while small and medium-sized vessel vasculitis respond better to a combination of cytotoxic agents and steroids. Therefore, a clear understanding of the size of the vessels involved and the pathophysiologic mechanisms are useful for the treatment decision [10,11]. other hand, is sensitive to detect gray and white matter lesions in CNS vasculitis, but the appearance of these lesions is usually not specific . Whether the lesions on MR imaging are reversible or irreversible depends on the severity of ischemia and seems to be related to size and location of the vessels involved. Occlusion or stenosis involving large, medium or small arteries mainly results in infarction, whereas lesions involving arterioles, capillaries, venules or veins predominantly cause vaso-genic edema or gliosis. 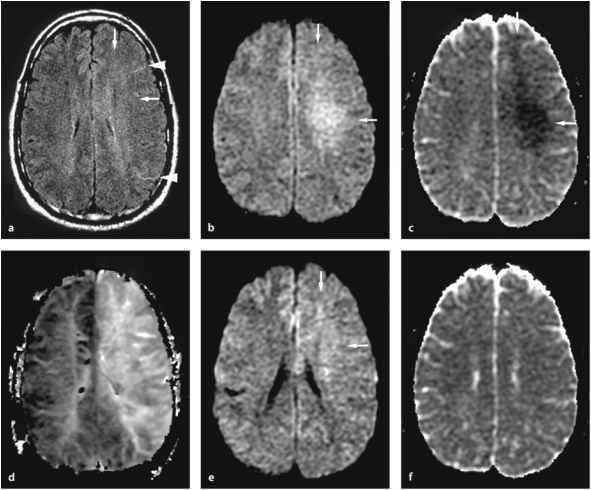 DW imaging can be useful to differentiate an acute or subacute infarction from va-sogenic edema or gliosis, which is important both for choice of treatment and to predict the long-term prognosis. Multifocal and multiphasic ischemia are some of the characteristic sequelae of CNS vasculitis. DW imaging can differentiate the phases of cerebral infarction as hyperacute, acute, subacute or chronic. The hyperacute phase of an infarction usually has a decreased apparent diffusion coefficient (ADC) and a normal or subtle increase in signal intensity on T2-weighted or fluid-attenuated inversion-recovery (FLAIR) images. The acute phase has a decreased ADC with hyperintensity on T2-weighted images. In the subacute phase, ADC values are normalized; in the chronic phase, DW imaging shows hypointensity with increased ADC.